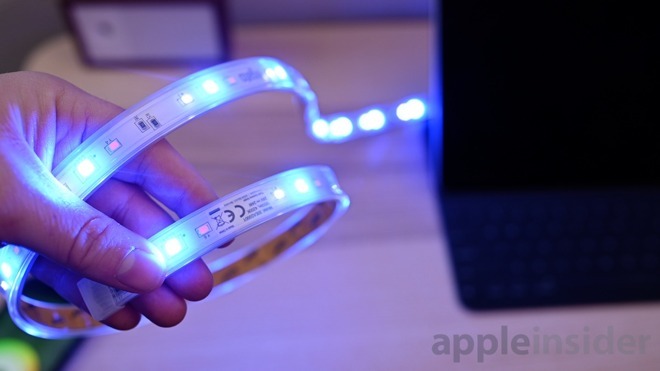 Eve previewed the Eve Light Strip earlier in 2019 during the annual Consumer Electronics Show. In such a bright and bustling atmosphere, it was difficult to fully judge the full impact of the light strip. Now that we've been able to test it out in our own home rather than the showroom floor, we are even more impressed. 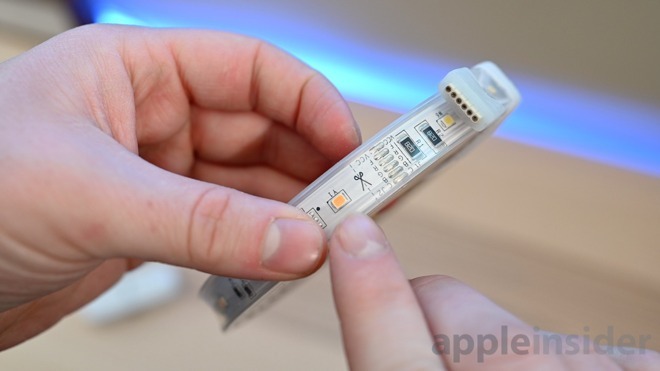 The Eve Light Strip is very similar to many of the other HomeKit light strips on the market. It runs 2 meters out of the box, or 6.6 feet to us in the U.S.
Extensions can be added in additional 6.6 ft lengths for a max size of 32.8 feet. It can be cut to length at pre-designated intervals as denoted by a dashed line and scissor icon on the strip itself. This gives it quite a bit of flexibility in matching the strip to the location you want illuminated. Just as with any other, once cut, it can no longer be extended. So before you cut, be entirely sure that is the length you will want it to be, forevermore. Light strips typically use adhesive to attach themselves to surfaces, and Eve's is no different. 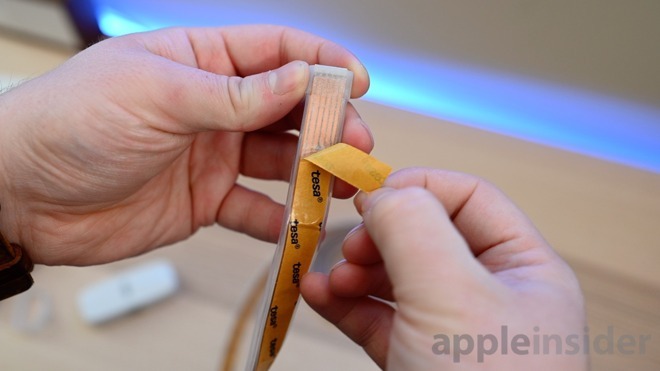 Remove the backing and attach the strip to whatever surface you choose. We've used light strips behind the TV, under counters, along floorboards, behind desks, under beds, down stairs, and much more. When you've installed the lights and are ready to connect them to HomeKit, you can either use the Home app or the Eve app. Eve is one of the best HomeKit apps out there so it is probably good to have around regardless if you don't already. Scan the code on the side of the wall adapter. or the included getting started guide, and iOS walks you through the usual process of connecting to Wi-Fi and adding to your home. Eve traditionally is an all-Bluetooth company, making the light strip the first of their products to include the different wireless protocol. When we asked Eve why the decision to go with Wi-Fi over Bluetooth and if this marked a shift in their strategy, they reaffirmed their support of Bluetooth. The reason the light strip uses Wi-Fi is that one, it is wall-connected so they don't have to worry about battery life. Second, they see the light strip as functional lighting, not just accent lighting. Because of that, they wanted it to be as fast and responsive as possible which means they had to opt for Wi-Fi this time. Wi-Fi traditionally has a bit more laborious setup process and isn't as seamless as Bluetooth, but it does have its benefits. It is slightly faster and is easier to connect to anywhere in the home. Also in the Eve app you can access additional settings such as what the default color is when the light turns on. It can turn on the same as the last color used, or just as white. Anogher useful feature is to control the transition between colors. What really sets Eve apart is the brightness. The Eve Light Strip is a crazy 1800 lumens. Compared to others in the market, this makes the Eve Light Strip the brightest out there. Other vendors have differing brightnesses in their offerings. This makes a huge difference in actually how you can use the light. It doesn't have to be just a simple accent light, it can add real functional lighting to your rooms. Most often these are tucked away and add some very cool colors, but you can get more creative in how these lights are placed in a room. For us, we tried a few different areas including facing upwards towards the ceiling above our cabinets and on top of the curtain box in the living room. They significantly brighten a room adding not just vibrant lighting effects, but real room-brightening light where we can adjust the temperature throughout the day. 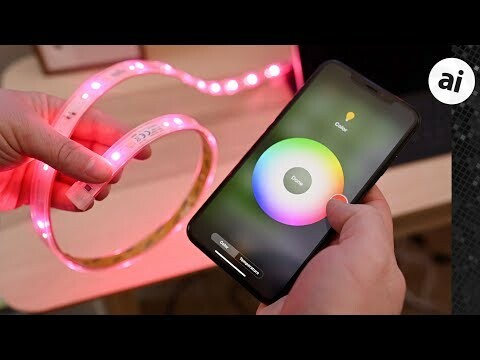 Our biggest problem with smart light strips like this, is the price. The price is fair, but it adds up when you want to add a bunch of these to your home -- and that is exactly what we want to do. As we tested different spots, we liked them all. Some areas we can get away with a dimmer option, such as behind our TV as a backlight, but we really wanted -- or needed -- the brightness that Eve provides. The Eve app is still fantastic and makes it easy to add the light to scenes, schedule routines, and change the color to any one of the thousands available. 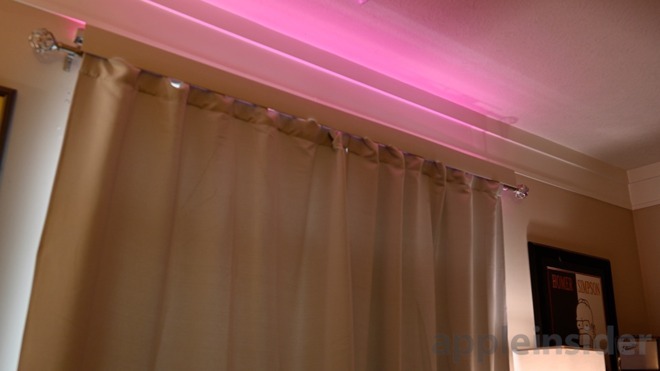 So far, the Eve HomeKit lightstrip is the best one of its kind that we've tested. 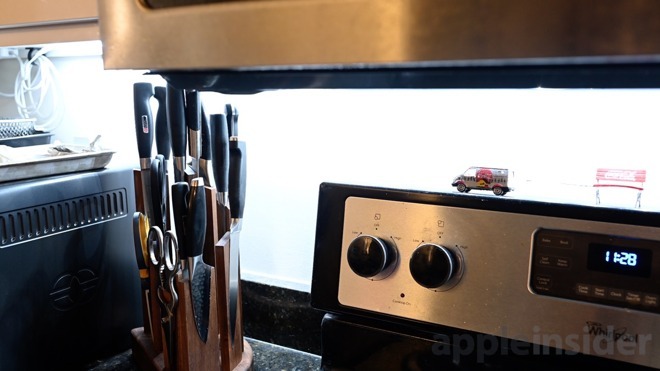 But, we still wish HomeKit had a bit more control for lights, such as the ability to brighten or dim them over time, without using fiddly automations. It would be amazing to mount these above the curtains in the bedroom and have them slowly brighten and shift color in the mornings, similar to the Hue feature. That isn't specifically the fault of Eve, but rather the limitations of HomeKit. 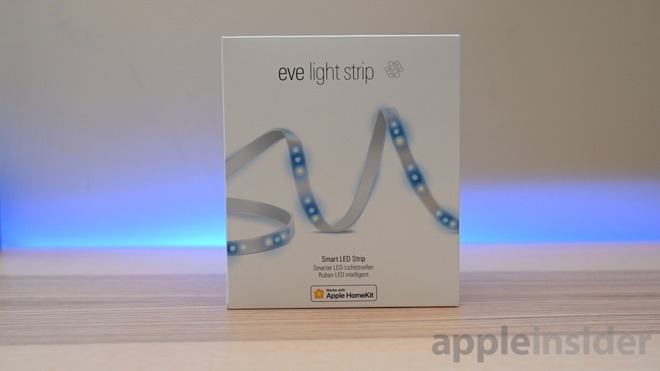 The Eve HomeKit-enabled Light Strip is available now from Amazon for $79.95 and can be paired with any other HomeKit accessories. Can different colors be applied to different sections of the light like the LIFX strip? No independent zones, but I dont miss that much. I have the LIFX one as well and I never use the zones. So i'm ok with just being brighter. WRONG! This product is 900 lumens per meter. Hue is 800. LIFX is 700. VOCOlink is 550 lumens per meter. You're quoting the lumens per 2 meter length for some and 1 meter for others. Looks like you got it fixed before I got this posted. Thanks! In a home setting the reproduction of yellow (tungsten bulb coloured lighting) is one of the most important, yet so far I'm unable to find a led strip that does this well. 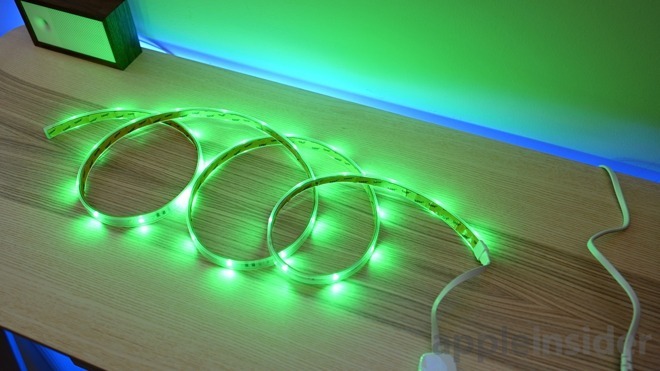 Modern led strips typically bundle a white diode (of ~4000K or higher colour temperature) with a RGB unit which relies on mixing to produce yellow. This rarely produces the yellow colour range well in practice (for that matter it also rarely produces other mixed colours well such as purple). For colour reproduction the current market best is LIFX, and my own testing has shown that it is still very much lacking in both yellow and purple. * This is really limiting as it means your strip is optimised for only two uses: Glaring hospital lighting or fun-house colour. * The yellow is always tinted green and the purple is either dominated by red or blue depending on which purple is chosen. The RGB-based strips are not able to reproduce these yellows very well. That’s why for Hue, they produce different bulbs that are not RGB diode based, which do incandescent shares perfectly — but aren’t so great at vibrant greens. This would be the very second device (after Leviton Decora Smart) to work with HomeKit but NOT Alexa. We need apple TV to get a HomeKit API accessible setting that can tell what the main color that its displaying on the TV is so these kind of color lights can sync up with them regardless of what app is showing the video content. Hue lights have this for PC's and its awesome, adds a lot to the movie/show you are watching. I know there are iOS apps that can use the camera on your iPhone/IPad to point at your TV but you need to set them up in the perfect spot and keep it their. PIA. Really hope some smart person at apple working on tvOS does this.